Today, everyone is being asked to do more with less while improving quality and reducing risk. The strategies and tactics of the past won't work because the world of manufacturing is far different today then it was 10 or even five years ago. 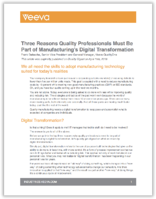 Download to see why quality manufacturing needs a digital transformation to keep pace and accomplish what is expected of companies and individuals.